Description: Aspen Canyon Ranch has a mile and a quarter of the upper Williams Fork, a freestone mountain stream that offers fun fishing for three species of trout in a lovely valley surrounded by 12,000-foot peaks. Approximately 40 feet in width with swift currents in the upper section leading to a canyon below. 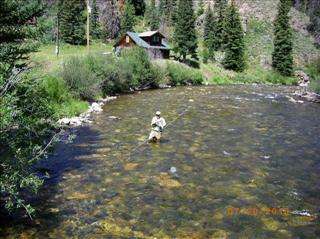 Fishing continues for another two miles on an isolated section of BLM land. Fish range from 6 to 16 inches. Lodging is available on the ranch. Location: The ranch can be accessed from the Ute Pass/Henderson Mill road off Highway 9 past Kremmling or from Parshall off Highway 40 on Road 3 (the Williams Fork Reservoir road).